I have stopped my car “hobby” and decided to get deeper into woodworking. I like the be able to make things, and woodworking is the best path to creating usable items. Over the last month I have been trying to pick up some tools that can increase what I can actually do with the limited space and time that I have. Over the last month I have picked up the following. I also already have a modified stanley bailey block plane, a LV low angle jack plane, a small gentlemen saw, a set of 1/4-1” bevel edged chisels, compound miter saw, jig saw, cicurlar saw, palm sander, and hand held belt sander. I am still looking to add some additional mortise chisels. I have some Witherby chisels nearby that I am going to refurb if I can get them. 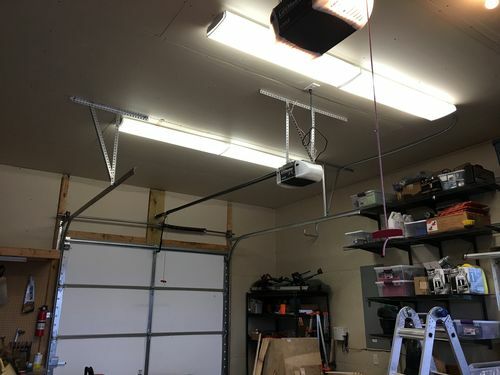 I also installed 4 4’ T5 HO lights above my work area. These provide a plenty of light for the area I will be working in. My next major tool purchase will be a 12-14” bandsaw. I am thinking of getting a 12” craftsman bandsaw just for cutting curves, and saving up for a laguna 14/Twelve or BX. I can get the craftsman right now used for $100-150. Until I can get a nice bandsaw for resew I will just waste wood by using the planer to get it to the dimensions I want. I am also going to keep my eye out on CL for a decent belt/disc sander. Here are some pictures to show what I am starting with. The full album is available here. Finishing building 3 more drawers fro my cabinet under my basic workbench. Finish rack on top of basic workbench. 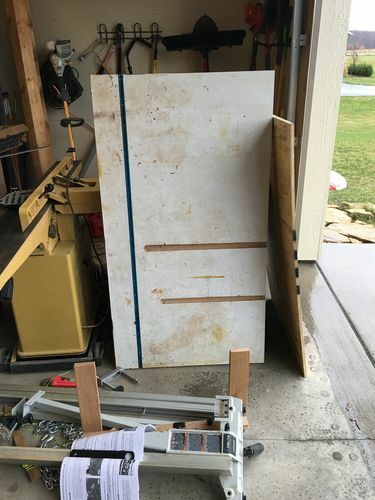 I am thinking of adding a 6” tall section for storing 2’ or scraps. Feel free to add comments and suggestions. I am new to all of this so ANY advice is great to have. Compared to the space I have, that looks more like a “large” garage space to me! Well you are certainly off to a great start tooling wise and you have a pretty nice space. Lots of folks out there are doing quality work in much smaller spaces. My advice is hold off on a bandsaw till you make a project that really needs it. 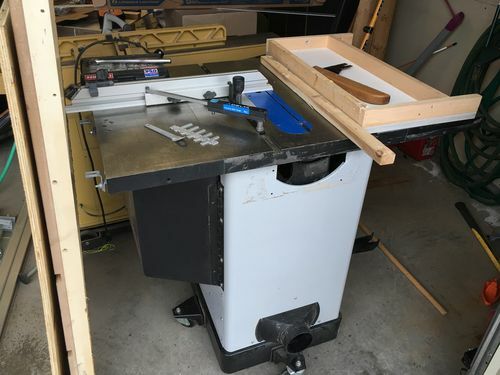 You already have a jig saw so you can make curves as needed, there doesn’t sound like much need to buy an interim bandsaw till you save up to buy the bandsaw you really want. Just start saving for that now. In the meantime also consider installing more then two 220 outlets. Not sure how many 110 outlets you have in there on how many different circuits but you will probably want a few extra of those. The HF dust collector will essentially need to run on its own circuit whenever you are also running a 110 volt tool and then you may also want to run some other equipment at the same time like a computer, a fan, etc. If you are installing new electric put the outlets over 4 feet off the ground, that way you can lean a sheet of plywood against the wall and not cover up your outlet. I already have 1 220 outlet, so I am adding one for the dust collector and one for the jointer. That is good advice on the bandsaw. 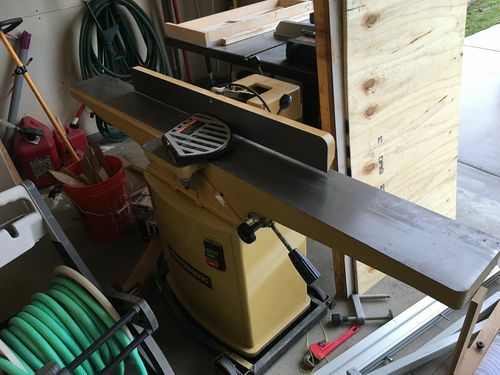 The only reason I would by the smaller band saw is because a friends dad is selling it. Otherwise I wouldn’t even consider it. I am working on a layout in sketchup right now. I will post a pic when it is done. It’s always enjoyable to set up a new shop and you have the makings of a nice one. I hope that it all goes off without a hitch. Congratulations and welcome to Lumberjocks. Here is the layout for the shop that I would like to do. Still need to add the planer. Great drawings. Now add the dust collector hoses and power connections. 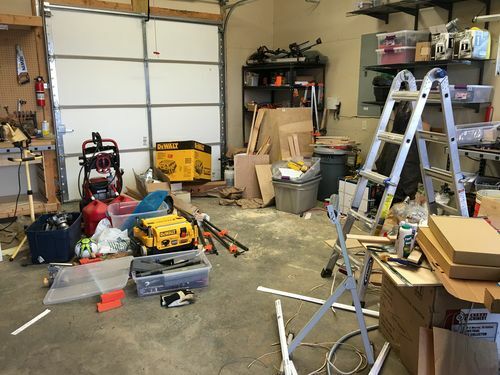 A small garage he says…there are prison cells are larger than my shop, but I enjoy my time in there a helluva lot more than prisoners do! Looks like you’re off to a decent rolling start. It has been mentioned but I would agree with skipping a smaller bandsaw, since you have a jigsaw. They are limited in their use and you will outgrow it quickly. I have the same jointer. You will like it, with the exception possibly of dust collection. I have done a few reorganizations and have always needed more room for the jointer than I accounted for. Plenty of infeed and outfeed space is required. Buy tools as you need them for projects you are actually building, not what you think you will need. Will save you $ in the long run. Good luck. Haha, I love all the comments on it not being a small garage. 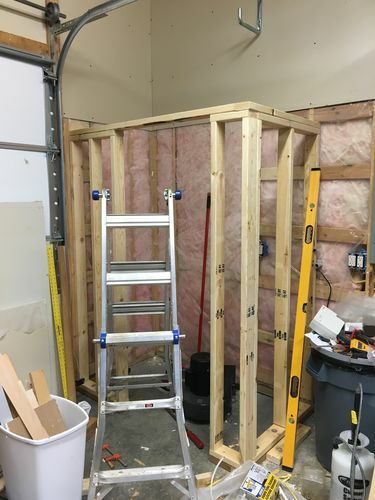 I know it is “adequate” for me right now, but my goal is to build a 16×20 workshop detached from the house so my wife will actually let me use power tools while the kids are sleeping. Thanks for the input on the bandsaw. It is probably a good idea to not have it right now, as was mentioned. It would just take up space while I don’t use it. I did just notice last night that the jointer does not have a dust collection port. Has anyone added one to it? Haha, yes, I do have a router. PC 1 3/4 HP with no plunge base. I also have a rout r lift that I have yet to install in anything since it was going to go into my old table saw, but now I have a new one. Thanks for the input on the bandsaw. It is probably a good idea to not have it right now, as was mentioned. It would just take up space while I don t use it. What are the dimensions of the current space? Pictures can be deceiving. Looks like you are off to a very good start, machinery and layout wise… Here is a a link to some info on my shop and how it is setup. The picture toward the bottom is the most up-to-date. 8×8 Area + 11×10 Area. Here are some pictures of the closet that I am building for the DC. Above it will be used as storage for some kind of wood :). I will be building the top, and maybe the door today. The door will be flush mount and drywalled. The door will have a wheel on the bottom since I am going to make it out of 2×4. I will probably store my clamps on the door. Electrical is done as well. Added a dedicated circuit for the DC, a new 120 circuit with 4 outlets that I will use for my 120 V devices, and a dedicated 220v outlet for the jointer. In total I have 5 120 outlets and 2 120 outlets now. There isn’t much room left in the breaker panel for much else. But since I will never use more than 2 220, and almost always 1 220v device at a time, I don’t need more than two. I also have the DC wired so I can easily convert it to a 220v 20a circuit, just in case I upgrade the DC. Granted if I did that I would have probably built a detached shop. 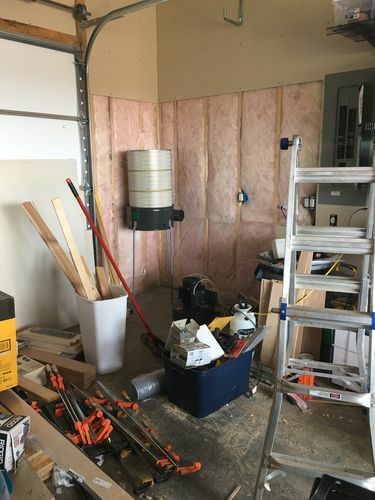 Good thinking putting the dust collector in the closet, I wish I had the space in my one car garage shop to add a closet for mine.